Researchers directly recorded neural activity in both sides of the brain’s cortex during the movement of only one arm in humans. 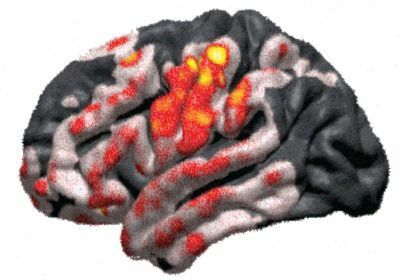 ABOVE: Artistic rendering of the locations and encoding strength (increasing from white to red) of neural activity recorded from electrodes on human subjects' brains. When you move only your right arm, there’s neural activity in both the left and right sides of the brain, researchers report today (October 8) in The Journal of Neuroscience. 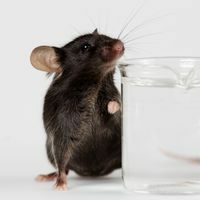 Recent animal and human studies have hinted that moving muscle on only one side of the body resulted in neural activity from the same side—or ipsilateral—part of the brain. But the data haven’t been convincing enough to completely erase the idea that only the left side of the brain is responsible for movement on the right side of the body or vice versa. The new study shows the ipsilateral brain activity encodes detailed arm movement information including position, speed, and velocity. 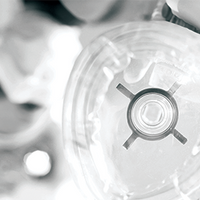 The results could one day be used to help improve recovery therapies for patients with brain injuries. “This is an important contribution to our understanding of how the brain controls arm movement because it reveals a greater role of ipsilateral brain activity than previously recognized,” writes Nathan Crone, a professor of neurology who runs a cognitive neurophysiology lab at Johns Hopkins University in Maryland and was not involved in the research, in an email to The Scientist. In the study, Eric Leuthardt, professor of neurosurgery, engineering, and neuroscience at Washington University in St. Louis, and his colleagues enlisted four patients with epilepsy who were to undergo surgery and who had electrodes implanted for a week under the skull. The electrodes were placed directly onto the cortex of the patients’ brain cortex regions, including the primary motor cortex—responsible for coordinating voluntary muscle movements. 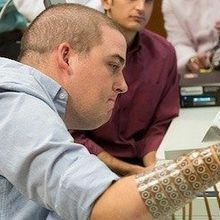 The patients volunteered to perform three-dimensional, individual arm motions while the researchers recorded neural activity from the implanted electrodes. The team then used machine learning to derive speed, velocity, and position information on each movement—gathering data on fine motor movements that cannot be easily captured using noninvasive techniques such as functional magnetic resonance imaging (fMRI). 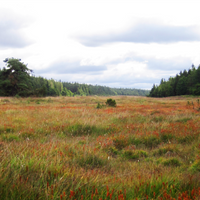 Based on previous study results, Leuthardt and his colleagues hypothesized that the neural activity from a single arm movement would differ in the right and left hemispheres. But, when the researchers compared the neural activity recorded in the left hemisphere for right arm movements and then left arm movements, the two patterns were very similar. They weren’t identical, but the brain activity in a single hemisphere could predict the movements of both arms, not just the arm on the opposite side. “What was surprising was how similar the [neural] encoding on the same side of the brain [was to] that on the opposite side of the brain,” says study coauthor David Bundy, now a postdoctoral fellow at the University of Kansas Medical Center. The neural activity mapped to the primary motor cortex and some premotor regions located in both the right and left brain hemispheres. “The study shows directly a relationship between the activity in the primary motor cortex and arm movement on the same side of the body, and is another piece of the puzzle that demonstrates that the primary motor cortex on the same side as the muscle plays a role in movement of the upper limbs,” says Cathrin M. Buetefisch, a neurology professor at the Emory University School of Medicine who works on neurorehabilitation. Study coauthor David Bundy demonstrating the study's hand movement task. 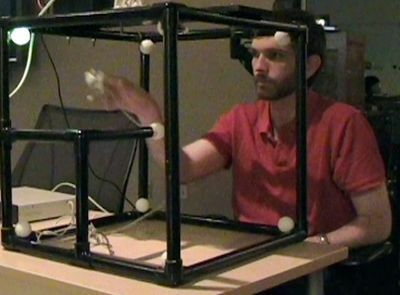 After recording the brain activity, Bundy and his colleagues used a model relating the neural patterns to predict movements of the opposite arm. “The model did much better than chance when we used the ipsilateral neural pattern to predict movement of the opposite arm and also when using the opposite hemisphere’s neural pattern when predicting movement in the same-side arm, suggesting that the motor movement information is conserved across hemispheres,” he says. Leuthardt adds that these results, together with prior evidence hinting that activity for movement on a single side is coded in both brain hemispheres, are promising for improving recovery for stroke and other brain injury patients. “Even if one side of the brain is injured, there is still motor information present within the other side that could be used to potentially restore muscle movement in these patients,” he explains. The epilepsy patients, volunteering their time to research, are “laying the foundation for technology to be used in patients with upper limb paralysis from a variety of causes, including stroke,” Crone says. “An important next step will be to demonstrate real-time online control of a virtual or real prosthetic limb using recordings of neuronal activity in ipsilateral brain regions,” he notes. Still, for Buetefisch, the study does not provide direct evidence that the primary motor cortex can actually execute a muscle movement command on the same side of the body. “Whether the right motor cortex can send signals to the spinal motor neurons that control the right side of the body to move the right hand, for example—that has not been shown. And that is the big piece that is still missing,” she says. The question now is, “What is the brain doing with the information that’s found in both brain hemispheres?” Buetefisch notes. D.T. Bundy et al., “Unilateral, three-dimensional arm movement kinematics are encoded in ipsilateral human cortex,” The Journal of Neuroscience, doi.org/ 10.1523/JNEUROSCI.0015-18.2018, 2018.